Transitioning back to ski mode after a long climb. Later this year I’ll be returning to the Himalaya, this time to join a handful of professional photographers where we’ll spend three weeks photographing the cultural treasures and mind blowing landscapes of northwestern Nepal. Having been to this region before, it’s hard to overstate my excitement to be returning to such a physically demanding and sensorially overwhelming part of the world. I consider myself a semiprofessional/avid hobbyist photographer where I sometimes sell my work to individuals or publications, but my primary income isn’t from photography. More than that though, I truly love the art of photography and I’m constantly striving to learn and expand my skills. I know traveling with a group of professional photographers from all over the world will be a treasure trove of information, and I honestly can’t wait to immerse myself in it, but it also brings a certain level of pressure, real or perceived. Much of our trip will be trekking at altitudes well above 4,400 metres (about 14,000 feet) with a couple of days over 5,500 metres (18,000 feet) and I think it’s safe to say the physical demands of this trip will be a given. Partner that with frenetic markets, language challenges and every other challenge that comes with international travel and the idea of trying to be “creative” all of a sudden becomes a little more daunting. There is no way to eliminate all the physical and cultural challenges, but what I can control is my proficiency with the tools of the trade. I’m pretty comfortable with my camera and it’s controls, but in the time I have leading up to my trip, I’ve dedicated myself to reviewing the basics, gaining efficiency with functions I don’t use as often and digging into some of the things I’ve never used but always thought would be helpful. When I step off the plane in Kathmandu I want my camera to be something I know so well that whenever creative photo opportunities arise, I’ll need to spend a minimal amount of time faffing around trying to figure out how to make it do what my creative mind wants. To help start getting myself used to more stressful shooting situations, I decided to give myself a little “pop quiz” in adversity during a photo assignment. I wanted to stress myself physically while simultaneously putting pressure on myself to cover all the photo basics necessary to make a competent photograph. In other words, I wanted to see if my procedures for composing and capturing a photo were second nature enough to where I could do it instinctually and not have to think too much. I would go to my local ski area well before sunrise and climb up to an observation point high on the continental divide. 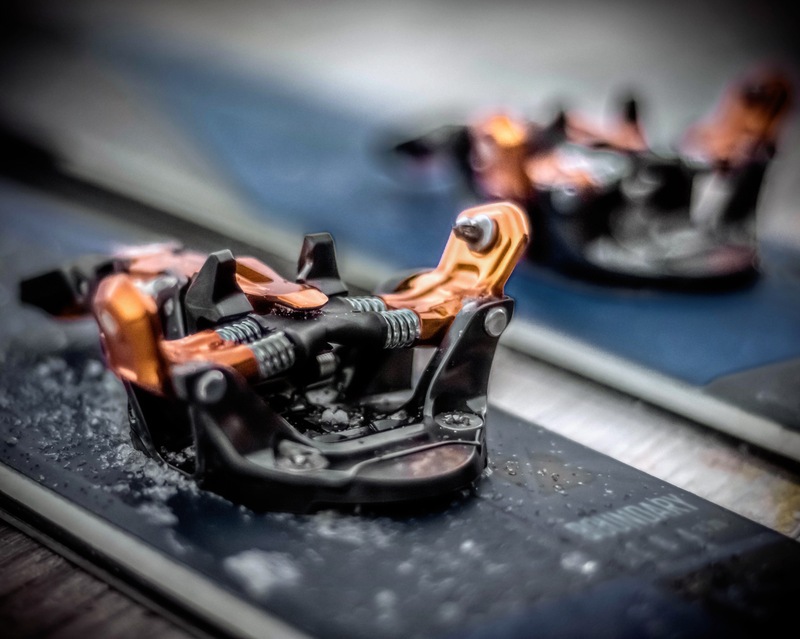 I wouldn’t be allowed to stop other than to adjust the risers on my bindings for the steeper parts of the climb. The point was to make sure I was physically “stressed” when I arrived. I would “reset” my entire camera to the default settings in order to force myself to think about every single step in making a photograph. I could meter in aperture mode but had to shoot in manual mode. I had to hand hold the shot. I would have a five-minute time limit to compose a photo, get my camera settings done and make the photograph…and only take one shot (complete pass or fail). Finally, I had exactly one hour to complete the whole challenge…car door to car door. I’m a pretty strong climber on skis, but I’m certainly no hyper speed randonee racer, therefore I knew I had to push the pace a little going up, but I also knew going too fast would redline my heart rate given I was already starting at about 3,350 metres (11,100 feet) to begin with! In short, I was able to climb to Ptarmigan Roost in about forty minutes. It took me a few more minutes to get situated, get a sip of water, strip the skins off my skis and make sure nothing would blow away since it was super windy. After that, I started the clock on my five minute “photo” allowance. I found a composition I liked fairly quickly, but because I was physically stressed and cold, I really had to stop and think through each part of my camera settings a little more carefully, which took time. Once I had the settings where I wanted, I quickly retraced each step since I only had one chance to get a “good” photograph, then I hit the button. I barely looked at the screen on my camera to see if I got anything worthwhile because remember, I still had to ski back down to meet the one-hour time limit. I quickly (but carefully!) crammed my camera back in my pack, glanced at my watch and saw that I had about 6-7 minutes remaining. I hurriedly clicked into my skis and let it rip. When I hit unlock on my car’s key fob, I still had three minutes remaining. The photo I took? Well, I was pretty happy given the circumstances. Maybe these challenges are silly, but it truly helps put me in situations where I’m not 100% comfortable and forces to me to fall back and reaffirm my knowledge of the basic skills. 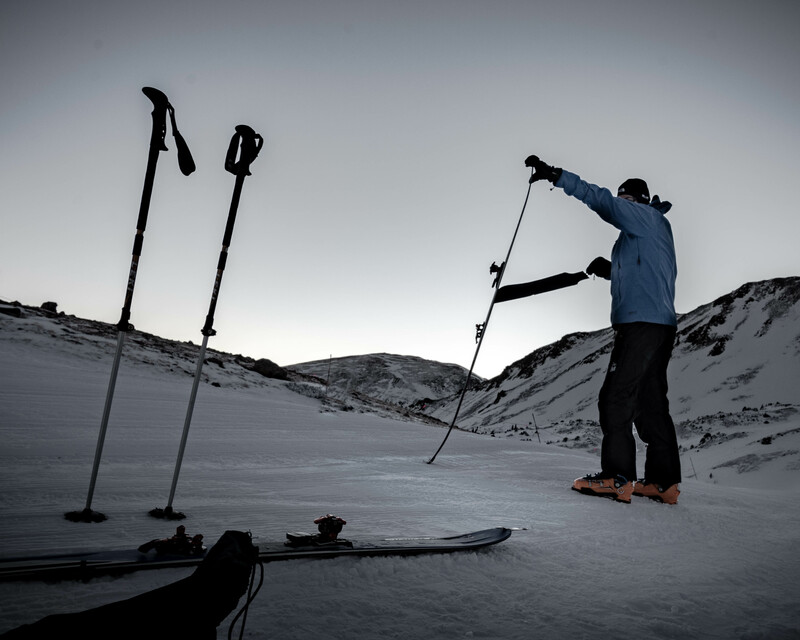 Climb high, ski fast, pedal hard, live simply.